Laguna Beach Republicans elected Fletcher Berryman as its new president, succeeding outgoing leader Howard Hills. 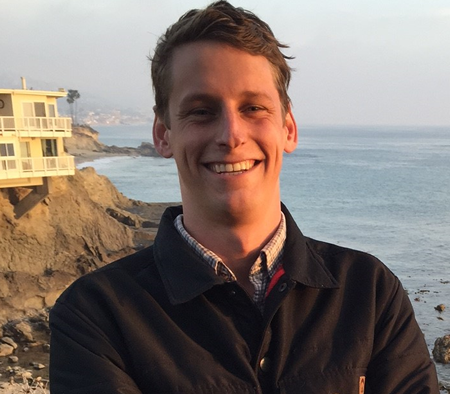 “We are going to build the broadest possible coalition of people in Laguna Beach who love our town and love liberty,” Berryman said in a statement outlining his goals. As examples of local reforms that need to be debated and addressed, Berryman cited lack of a public skateboarding venue and how and when the no-take fishing ban can be modified. Chief Jeff LaTendresse, right, with Bryan Sarjeant. 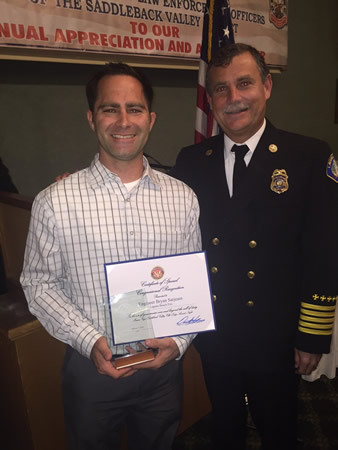 Laguna Beach Fire Department engineer Bryan Sarjeant and reserve firefighter Pat Knodel both received recognition as firefighter and reserve of the year, respectively, at a firefighter appreciation dinner last week. Knodel was unable to attend. In addition, firefighter-paramedic David Lopez was promoted to the position of engineer. Lopez, with the department since 2010, previously worked as a fire dispatcher for the city of San Bernardino. He’s known locally for playing bagpipes at ceremonial events.